Alcohol use—as a well-established part of human culture—is something that has become almost as acceptable as eating and breathing. As a social facilitator and feel good drug of choice for many, alcohol is very popular indeed, with consumption at mass levels. However, alcohols well-documented deleterious effects—diminished performance, mental impairment, possible addiction, diabetes and liver disease to varying degrees in certain individuals—could be seen as a good reason to steer clear of it. This being said, many people enjoy its sedating influence and it does play a vital role in many of society's traditions and practices. One effect alcohol has, which is not widely discussed, is its impact on body composition. In its purest form, ethyl alcohol, which supplies seven calories per gram, alcohol provides energy, bumping up ones total energy balance whenever it is consumed. Unlike macronutrients such as carbohydrates, proteins and fats, alcohol supplies what nutritionists often refer to as empty calories: calories without nutrition. To make matters worse, it is the first fuel to be used when combined with carbohydrates, fats and proteins, postponing the fat-burning process and contributing to greater fat storage. "Here's the problem with all alcoholic beverages, and the reason I recommend refraining from alcohol consumption on the diet. Alcohol, whenever taken in, is the first fuel to burn. While that's going on, your body will not burn fat. This does not stop the weight loss, it simply postpones it, since the alcohol does not store as glycogen, and you immediately go back into ketosis/lipolysis after the alcohol is used up. If you must drink alcohol, wine is an acceptable addition to levels beyond the Induction diet. If wine does not suit your taste, straight liquor such as scotch, rye, vodka, and gin would be appropriate, as long as the mixer is sugarless; this means no juice, tonic water; or non-diet soda. Seltzer and diet soda are appropriate." Although Mr. Atkins suggestions are valid ones, especially as he is advocating the elimination of additional sugars along with the higher calorie beers, any form of alcohol can pose problems for those wanting to shed unwanted fat to look their best. Alcoholic drinks also contain calories from other sources, which add to overall caloric intake. Certain cocktails, for example, contain fats. Wine and beer both have high carbohydrate content. Although the affects these various calorie types have on the body are different—carbohydrates release insulin, which can hasten fat storage, while fats will be stored directly in the fat cells—the overall result is added body fat. Beer contains more carbohydrates (although many of the "Lite" beers have a carb content similar to a glass of wine) and less alcohol than wine, but is seen as being more fattening, due to its higher energy content. Alcohol tends to have an appetite stimulating effect as it provides little in the way of nutrition, leaving a craving for other foods at the time of consumption. 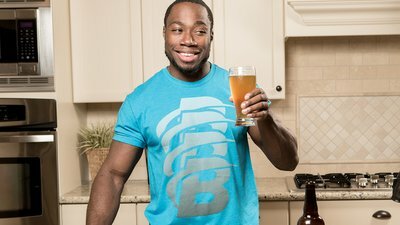 Add this to the fact that fatty and salty foods tend to accompany most occasions featuring alcohol (as well as alcohol actually stimulating one's appetite for these kinds of foods), and the general loosening of resolve that goes with an inebriated mindset, and you have a recipe for excess fat gain. Alcohol has also been shown to affect motivation, making a healthy diet harder to stay on while it is being used. The liver—which processes toxins and breaks down fats for fuel—is crucial when it comes to maintaining a healthy body composition. Alcohol is at its most destructive during the liver's detoxification process. The alcohol content of our most popular beverages varies, so it is important to know exactly what percentage of alcohol is in any given drink if one is wanting to limit all the empty calories. The following percentages are usually contained in each standard drink—five ounces of wine, 12 ounces of beer or 1.5 ounces of 80 proof (40% alcohol) distilled liquor. 14 milligrams of sodium (1%). 12.6 grams of carbohydrates (4%). Total Calories: 153 (includes 97 calories from alcohol). Total Calories: 105 (includes 78 calories from alcohol). Total Calories: 85 (includes 77 calories from alcohol). Total Calories: 165 (includes 110 calories from alcohol). Total Calories: 74 (including 66 calories from alcohol). Total Calories: 123 (including 105 calories from alcohol). Total Calories: 120 (including 98 calories from alcohol). 4 grams of carbohydrates (all of white are sugars). Total Calories: 64 from alcohol content. 5.8 grams of fat (3.5 grams of this saturated fat). Total Calories: 121 (including 35 from alcohol). 11 grams of carbohydrate (10.9 of this is sugar). Total Calories: 103 (including 70 from alcohol). Total Calories: 100 (including 70 from alcohol). Total Calories: 95 (including 56 from alcohol). Total Calories: 110 (including 42 from alcohol). 11.2 grams of carbohydrate (all sugars). Total Calories: 107 (including 63 from alcohol). Combine this with one glass of coke (around 180 calories, 95% of these from sugars) and your typical bourbon and coke could supply 308 calories—double the number found in the average can of beer. Wine generally contains around 100 to 125 calories per medium sized glass. It also contains more alcohol than beer given the same volume, making it a better choice calorie-wise, as less would be consumed at any one sitting. The worst alcohol choices would be the cream based drinks such as eggnog (340 calories without the alcohol) and an Amaretto Sour (includes tequila and orange juice and contains 421 calories). The highest calorie cocktail of the all would be the Vodka Mudslide, which contains coffee liqueur, Irish cream and vanilla ice cream and supplies 820 calories. Larger amounts (more than seven drinks at any one time), often described as binge drinking, can cause major problems and probably should not be advocated. Maintaining reasonable levels of health, while enjoying a few drinks—using moderation as the key—should be no problem. However, athletes—who definitely are not your average population—wanting to improve performance, and those wanting to lose weight are a different issue entirely. Ray Audette, author of the NeanderThin Diet, provides sound advice for anyone wanting to lose weight while drinking alcohol. Remember, to be at your best physically you can't have it both ways and Mr Audette provides a good rationale as to why. "Don't Drink Alcohol[.] It is best not to consume alcohol in any amount from any source. Alcohol is a by-product of yeast digestion (the yeast equivalent of urine) and is known to damage the stomach, kidneys, and liver. Alcohol adds fat principally by producing cravings for both it and other carbohydrates (see snack trays at any bar) and even other addictive substances (ask any former smoker.) It is almost impossible to drink alcohol and follow the hunter-gatherer lifestyle. If you must drink, do so only on special occasions (once or twice a year) and stick to alcohols derived from fruit (wine and champagne.)" Borushek, A. (2006). CalorieKing alcohol information.